As more Americans live in privately owned communities, more lawsuits arise. BEND, Ore. (CNN/Money) – Three years after moving into a new 4,700-square-foot home in Brook Hills, a gated community near San Diego, Sonni and James Bass are caught up in an expensive legal battle with their homeowners association. Brook Hills is suing the Basses, who are returning the favor with a countersuit. Why? The association says they took too long to do their landscaping. Plus, they installed a light on their tennis court without approval. Sonni and James Bass are fighting their homeowners association over the landscaping on their property. "All my clients have tried to do is enforce the rules," said Michael Kim, an attorney with Peters & Freedman, the firm that represents Brook Hills and about 500 other homeowners associations. the landscaping on their property. sending a letter asking the Basses to "please remove" the light. "Anyone who did extensive landscaping took more than a year," countered Sonni Bass. "I'm the only one who's being sued." As for the light on the tennis court, she said, "the board president threatened to remove it with a jackhammer." The squabble may sound familiar, because disputes just like it are happening across the United States. About one in six Americans lives in an association-managed community, according to the Community Association Institute (CAI). An estimated four out of five houses built since the late 1990s are governed by a homeowners association. As more people move to such places, the adage that fences make good neighbors no longer seems relevant. In fact, your neighbors might not let you even put up a fence. The primary purpose of a homeowners association is to manage a neighborhood's common areas such as roads, parks and pools. Homeowners are obligated to pay dues – which can be anything from $100 to $10,000 a year, depending on the neighborhood and its amenities. Homeowners are also obligated to live by the association's rule book, also known as covenants, conditions and restrictions (CC&Rs). An elected, volunteer board of directors is responsible for enforcing these rules. The regulations vary widely but typically cover such things as the color of your house, the kinds of trees you may plant, where you can park your car and whether you can rent out your home. In some neighborhoods, homeowners have faced fines for such offenses as flying the American flag, decorating for unapproved holidays or putting the wrong color curtains in their windows. 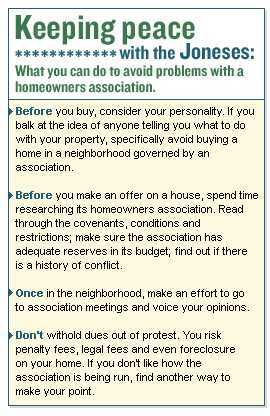 Homeowners associations even have the right to foreclose on those who fail to pay their association dues. According to a study by Sentinel Fair House, a fair housing group in California, associations were responsible for 18 percent of all foreclosure actions in five counties they studied over a 12-month period. All told, associations foreclosed on about 70 houses in five counties for amounts of less than $2,500 – including legal fees. "The punishment does not fit the crime," said Michael Macomber, an attorney for Tom and Anita Radcliff, a retired couple in Copperopolis, Calf., whose home was foreclosed on by their association in January because the couple did not pay the $120 in annual dues they owed. The majority of homeowners are happy with their associations, claimed Frank Rathbun, spokeman for CAI. Not only do such associations give owners access to amenities they may not be able to afford on their own – such as swimming pools and private security – they help protect property values, he added. "While the rules may seem arbitrary, you have to ask yourself, 'What if every resident did the same thing?'" said Rathbun. In other words, the fact that your neighbor can't put his car on blocks in the front yard is probably to your benefit. Critics of homeowners associations, however, argue that the bodies have too much power and not enough oversight. "There needs to be a regulatory agency that creates rules [of conduct for associations] and enforces them," said Jan Bergemann, a retired hotel owner and chef in St. Augustine, Fla. who founded Cyber Citizens for Justice. "Few people can afford to hire a lawyer just to get minutes from a homeowners association meeting." At the very least, say homeowner advocates, there should be more disclosure about the constraints of living in neighborhoods governed by associations. "You need to know that you're essentially giving up your property rights," said George Staropoli, a resident of a homeowners association in Scottsdale, Ariz., and founder of Citizens Against Private Government HOAs. Buyers typically don't get a copy of the association's CC&Rs until they close on their home or move in. Unless they specifically ask about association rules or a real estate agent points them out, they may not understand the implications of buying in a particular neighborhood until it's too late to back out. Even if homeowners do manage to get through the CC&Rs -- which are often written in legalese and inches thick -- they still may not understand the consequences of not abiding by the rules, said Staropoli. Sonni Bass certainly never imagined that her landscaping would turn into a high-stakes lawsuit. "I'll never move into another neighborhood with a homeowners association," she said. "I had no idea what we were getting into."